Shopping for dinner at the Cattail pond! 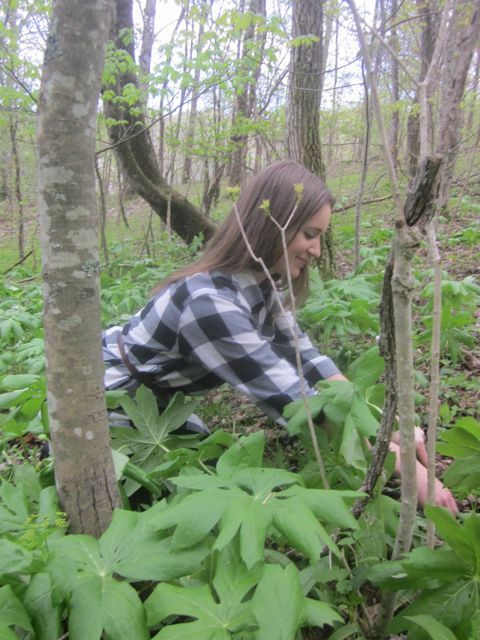 I eat wild edible weeds and I eat Paleo. Which means that I eat REAL food, most of it FREE for the picking. Ever notice how hard it is to get rid of weeds? Perhaps there is a significant reason for this. They are good for us – and even tasty! Weeds find ways to thrive even in sidewalk cracks, and they survive multiple salvos of chemical attacks redoubling their efforts to be there for us. They don’t require cultivating or any special care. 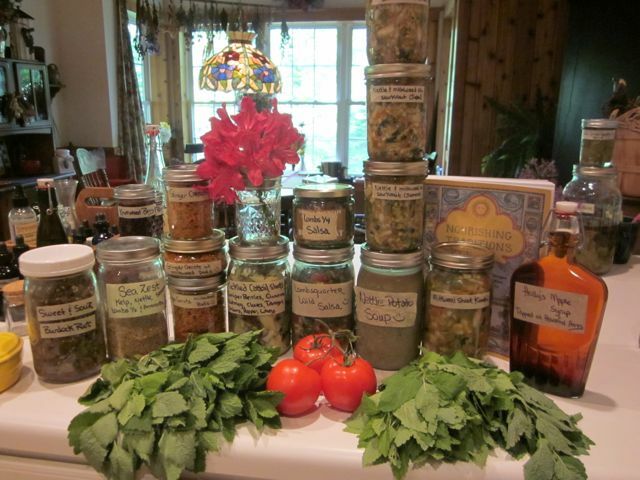 I think it is worth rediscovering these weedy hidden treasures that were used for centuries by our ancestors for food and healing. 1. They are fresh (not shipped from far away) and their enzymes are still vital. I picked my wild dinner minutes before I ate it! 2. They are not genetically modified. Genetic tinkering and cloning of our food supply is a growing reality and it is not even labeled as such. Unless we buy certified organic produce or grow our own vegetables we really don’t know what we are eating. 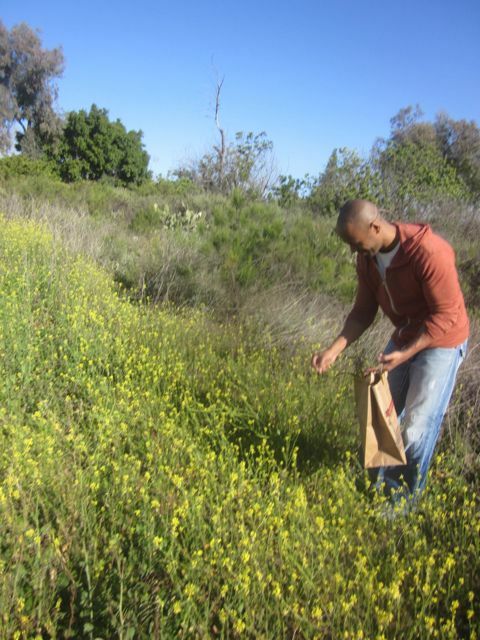 Which brings me to this captivating thought, weeds bring up subsoil nutrients and enrich the soil with the vitamins and minerals that are often depleted. Thus, wild edible plants are 5-7 times higher in nutrition than cultivated foods…and I don’t have to tend them! 4. They are FREE! Eating healthy is expensive. 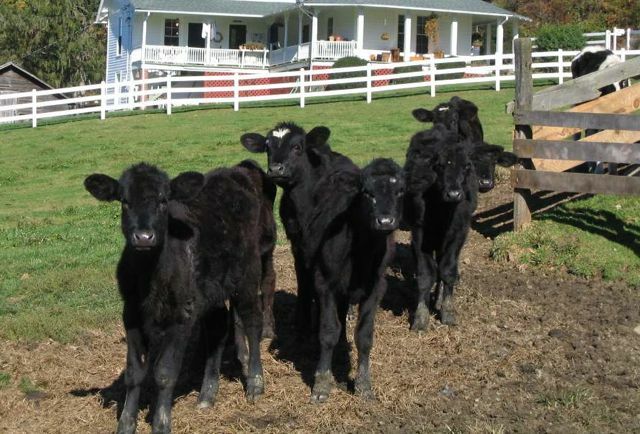 Grass finished meats, free range eggs, raw milk (if you can find it), organic vegetables, fruits and berries…it all adds up. Though if we really consider the fact that we are fueling our cells to keep us healthy and not merely filling our stomachs, it makes the expense worth it. Too much obesity and disease results from consuming processed, chemically treated, genetically modified, HFCS and wheat laced ‘foods’, or sick meat from CAFOs (Concentrated Animal Feeding Operations). I’ve heard it said, “would you rather pay the grocer or the doctor?” If food is meant to be our medicine and medicine our food then yes, the expense is worth it. 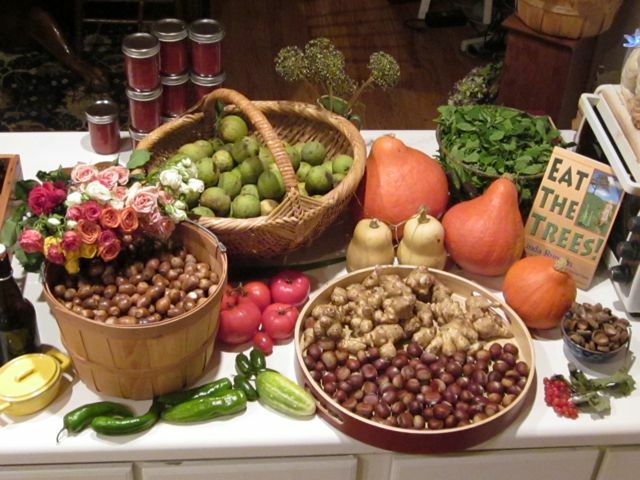 BUT eating wild yummy roots, greens, shoots, buds, flowers, pods, seeds, berries, fruits and even bark is FREE! There is ‘no such thing as a free lunch’, my Dad used to say. So, what is the catch? There are hidden costs to this free food. The price tag is Wisdom and Time. 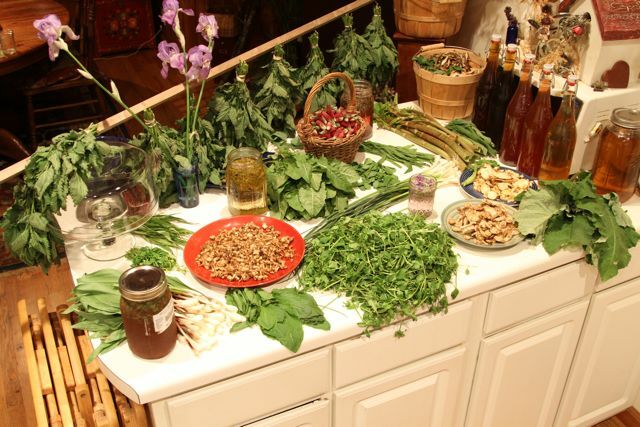 Wisdom: Wild foods are free for the gathering but there must also be a knowing. This knowledge used to be common sense to our ancestors not that many generations ago. It is time to reclaim our wild heritage. 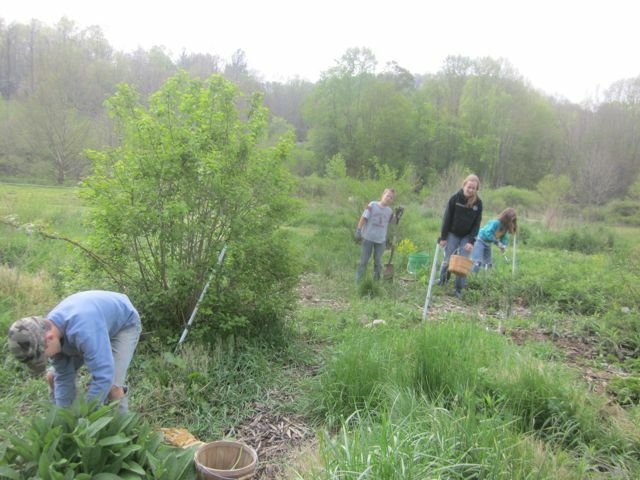 Knowing what the plants are and what parts are edible and when they are best harvested, with 100% accuracy, is a learned skill. 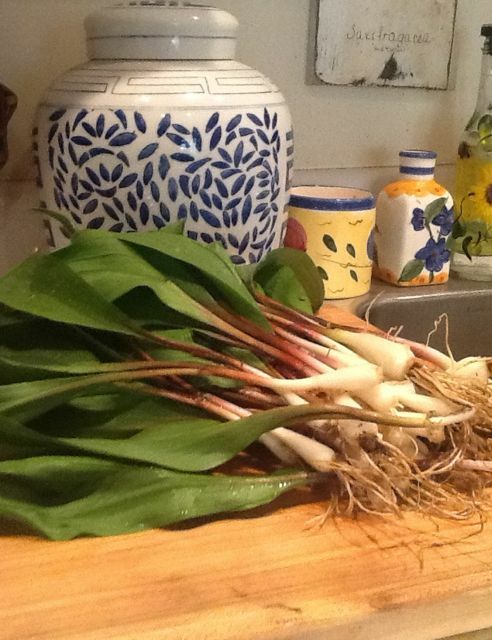 It is preferable to learn from a local expert who can show you the plants in season and even cook with them. This website is devoted to teaching others to reclaim this lost art. 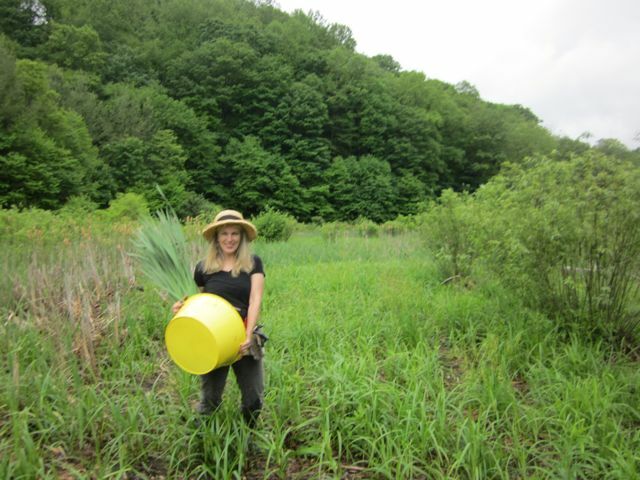 Linda Runyon’s website Of the Field.com has many free resources (hundreds of podcasts, free newsletter, foragers forum). Her outstanding book “The Essential Wild Food Survival Guide”, is my favorite in my wild library. Buy it from Linda, mention Holly Drake and you’ll receive a free eBook with her fabulous recipes. Time: It takes me considerable time shopping in God’s grocery stores. I foraged for the wild ingredients to feed 100 people last week. 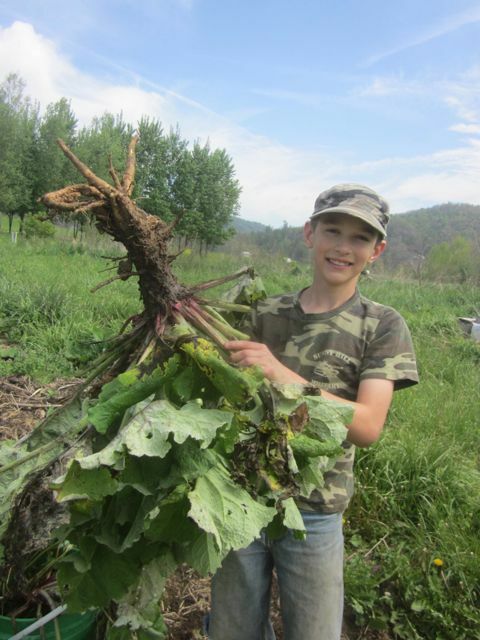 It took several days of casual gathering and a solid afternoon of foraging with 4 young enthusiastic helpers. We collected bucket loads of fresh produce. It was hard work but it was also great fun. Gentle breezes, warm sunshine (Vitamin D), bird songs, butterflies flitting, the smell of Spring, gasps of discovery when a patch of some wild delectable was discovered, washing roots in the mountain stream, nibbling on sweet Clover heads for a snack, learning and laughing together…. my kind of shopping! Is that what you remember of the last time you shopped at Sam’s Club? Of course wild foods don’t come in plastic wrap, debugged, and sitting on grocer shelves. The gathering is only the beginning. The next step is called, GARBLING. Garbling is when the ‘groceries’ are dumped in a pile and sorted. Each plant is inspected for it’s quality, bugs are removed (actually there is an easy trick to do that), hitchhiker plants are discovered and disposed of (plants that were grabbed by mistake), dead leaves or bug bitten leaves, or fibrous stalks eliminated. Once everything is garbled with careful inspection then the ‘catch’ is either hung in bundles to dry, chopped roots to dry for future use, parboiled to freeze, or used immediately in cooking supper. 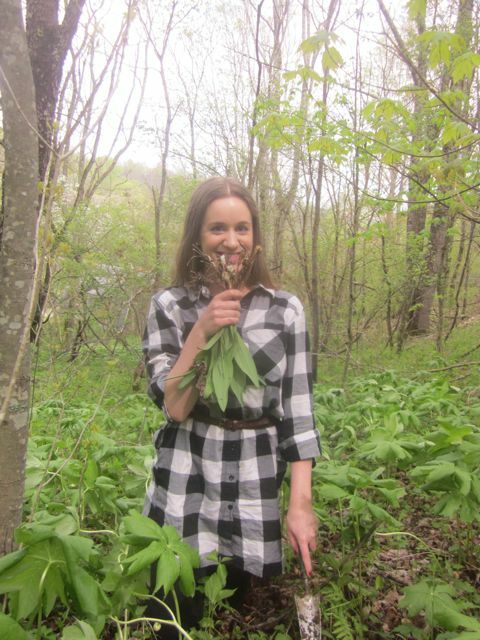 Holly’s Wild Shopping Guide will give you more details in how to shop WILD from forage to storage or feast. From teat to grass finished...CLA's anyone? Paleo for me is basically, eating lots of protein from happy animals, omega 3’s from free range chickens, raw milk (yogurt, butter), lots of bacon (just had to say that, since as a vegetarian for 10 years I was bacon deprived), fermented foods and lots of wild or organic greens and veggies. I just started eating a paleo diet ‘in earnest’. I have been dabbling with cutting out grains and carbs for a while…but…I have this thing for bread with a good chew factor, slathered in organic butter, piled high with homemade wild jams while I sip on a great cup of coffee. I became a wonderful baker, perfecting this skill over the years and was just beginning to add wild flour to the mix to ‘up’ the nutrition. But the truth is that ‘heart healthy grains’ is an oxymoron. Sad but true. Check out http/www. undergroundwellness.com and listen to Sean Croxton interview numerous professionals who have documented the hazards of wheat in our diet. You’ll learn that the government recommended diet including heart healthy grains is a major factor in the rise of diabetes and auto-immune diseases. 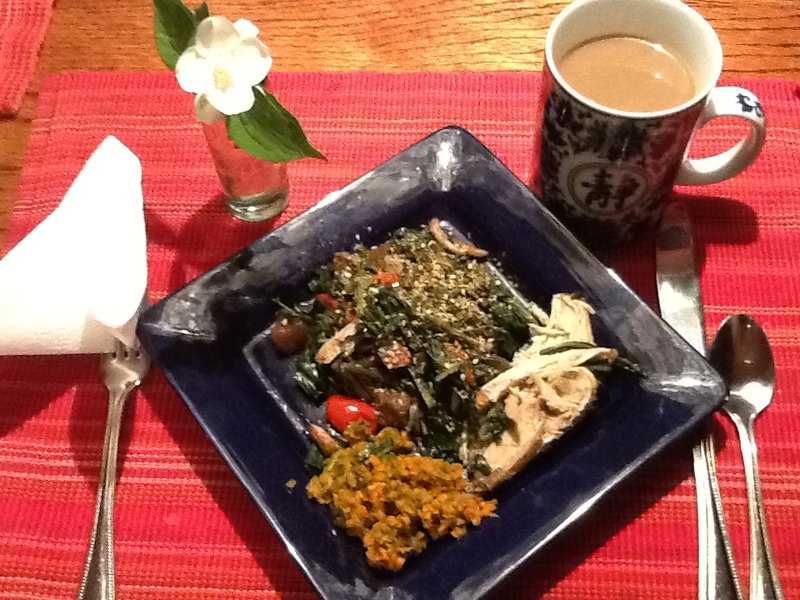 So my latest challenge… how to mix it up with Wild & Paleo! Here are 7 ways that work for me. The recipes are hyperlinked to my Wild Blessings cooking section. I just read a novel called, Into the Forrest, by Jean Hegland. This is the story of two teen aged sisters living alone over 30 miles from the nearest town, and several miles away from their nearest neighbor in a futuristic scenario of survival. Nell and Eva struggle as society begins to decay and collapse around them. No single event precedes society’s fall. The electricity is erratic and then it is gone, permanently. The sisters consume the resources left in the house, waiting for the power to magically return. Eating their way down to the last remaining mason jars of food and drinking “white tea” they finally discover an overlooked book in their mother’s pottery studio, a guide to wild edible plants. It was a relief to me to read how they finally discover the abundance surrounding them, their white tea which is nothing more than heated water becomes a rich store of choices. Feeling empowered with their ‘food’ discoveries the sisters face the future with growing confidence. I have over 100 teas in my pantry with which to infuse in hot water or drink as a tea. 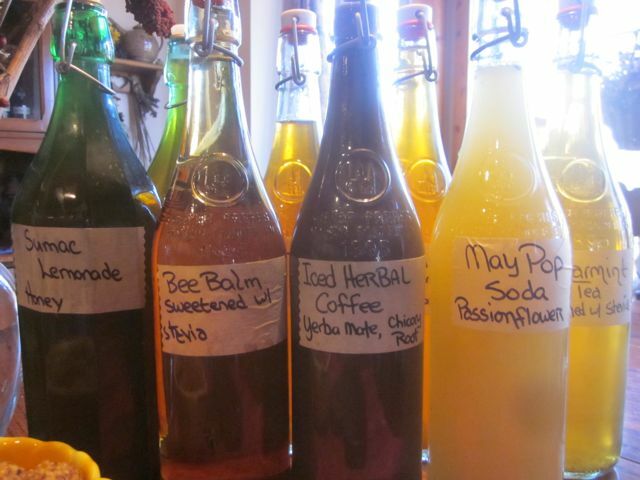 Many are both tasty and healing, and they were all free for the knowing and the storing. Teas can also be frozen as healthy popsicle treats for children and us big kids. I am also a big fan of roasted Dandelion root coffee. It is my preferred laxative and I like to drink it with cream from raw milk… with a touch of Cinnamon….. hmmmm…. 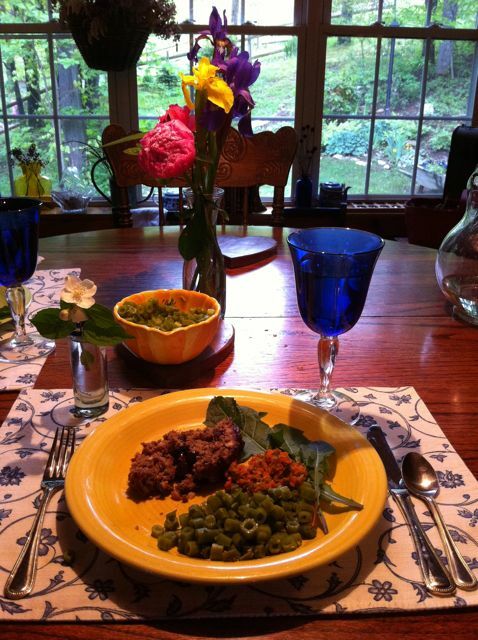 I posted this on Facebook along with my daily wild forays and cooking adventures. “I collected 90% of tonight’s dinner while weeding my mom’s vegetable garden this afternoon. 40 Dandelions complete with roots (which I will dry and roast later), Evening Primrose roots, Wild Onion. I washed the Dandelion greens and chopped to bite sized pieces then stir fried them in bacon grease with the wild onion. I steamed the Evening Primrose roots in wine till tender and added them to the mix. To add flavor and more ‘wild’ I added a spoonful of Purslane chutney (made last Summer), three cherry tomatoes and Wild seed seasoning (Plantain and Lambs quarter seeds). Fermented Gingered Carrots and Milkweed on the side and a serving of happy chicken for the protein. Dandelion root coffee sweetened with Stevia from my garden and raw milk for cream. The Dandelion greens are a constant at each meal as Susun Weed claims eating them solves digestive issues like magic. They are bitter, but with the sweet jelly they tasted refreshing. If you have the cookbook Nourishing Traditions by Sally Fallon, or listened to Underground Wellness with Sean Croxton, or eaten a paleo diet for long, you will learn that Bone Broth stocks and soups are an excellent source for vitamins and nutrients. There is quite an art to making a good stock. 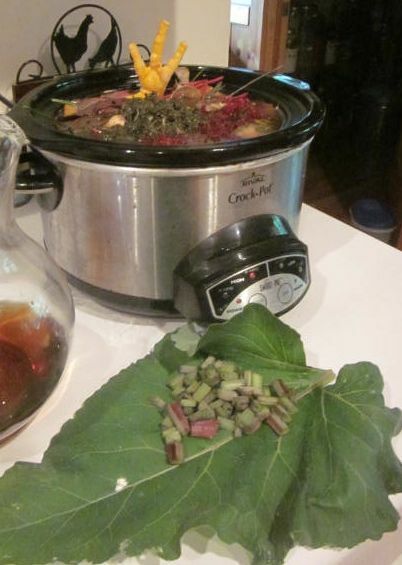 I’ve written about it extensively here: http://wildblessings.com/2011/09/10/stone-soup/ and continue to find ways to add wild ingredients into the mix increasing the nutritional value but adding no extra cost. I save every food source that I don’t use up that is still storable in my freezer (bits and pieces of wild greens, roots, stalks, buds.) The nutrition is still available to be released in the broth as it simmers. These stocks are the springboard for great healing soups. And don’t forget the magic ingredient with a surprising amount of nutrition – chicken feet. Wild Tortilla soup was on the menu the other day. I added to the basic stock: chicken, black beans, corn, milkweed shoots (cut ‘bean’ size), wild salsa, ramps, wild onion, cumin, oregano, chili powder, salt and pepper. Not only was it tasty but it was super nutritious. The black beans were not necessary, for those of you legume haters just add more milkweed shoots and simmer till all the flavors meld, the chicken is white and the milkweed shoots are tender. 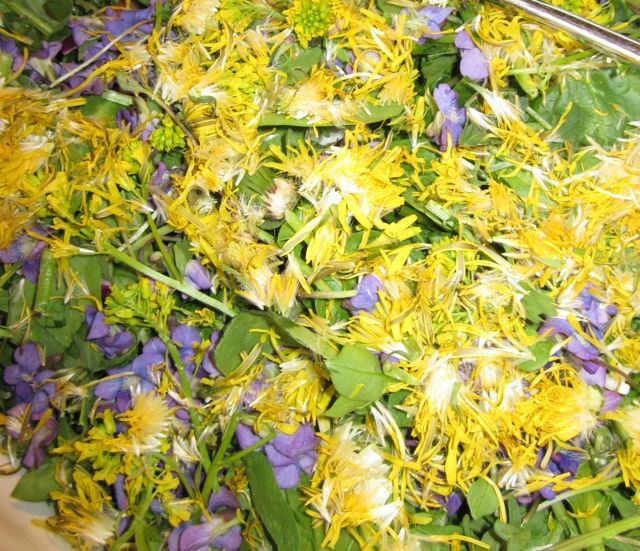 Whether you are foraging for wild free plants to simmer in bone broth, eat raw in a salad, toss in a coconut oil stir fry, infuse for healing teas, ferment with raw whey for the probiotics, or simply steam and season as a vegetable, I hope I’ve spread a bit of your curiosity for adding WILD ingredients to your Paleo diet. You can befriend me on Facebook where I often relate what is in my forager’s basket and how I cooked it for dinner, follow my wild tweets or find recipes, plant bios and informative blogs on this website. I challenge you to reclaim your wild heritage. Here is one of my favorite nutrition and health experts, Sean Croxton, beginning his journey to the wild side!